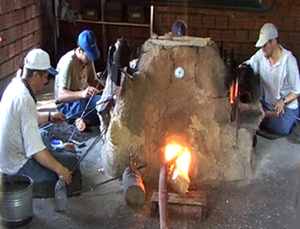 In Turkey the tradition is to make glass beads in a unique, specially designed furnace around which the craftsmen sit. Through his own window, the craftsman manipulates and embellishes the bead in the fiery interior. In Ghana, the base ingredients of the glass beads are assembled in moulds. The moulds are then fired in a kiln and the ingredients are transformed into colourful glass beads. 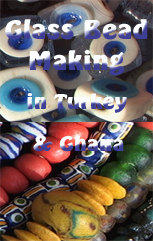 Filmed in the workshop of Mahmut Sur in Kurudere near Izmir, Turkey, and in the workshop of Nomodo Djaba in Krobo, Ghana.